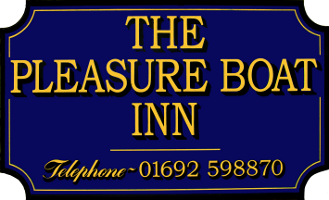 The land on which the Pleasure Boat Inn now stands, and the original building, was sold by the local landowner to a private couple in the mid 1700's. The inn and staithe were then used by the local wherries, transporting coal, peat and grain, to the village. With the advent of the railways, the use of wherries diminished by the late 1800s and the inn was then used as an alehouse and hostelry, with accommodation above. Records show one of the Landlords, Mr. Beales (There are still Beales in Hickling village to this day), purchased a Wherry as a pleasure craft which he ran from the staithe outside the pub, so it is possible that this is when the name The Pleasure Boat Inn originated. The pub holds a gratifying number of old papers concerning the pub, including a Deed Of Consent for Robert Moore which, at one time, had been hung in the pub for inspection. The wording of the deed is interesting, mentioning that the land was used for grazing and was to permit the enclosure of eight acres, under the Act of 1789, for "planting with trees and underwood". Underwood would be the willow wands that would be stripped and used for basket making. The "Consent" was under the patronage of Squire Nathaniel Micklethwaite, whose mother, the widow of the Lord of the Manor of Hickling Overhall, Hickling Netherhall, and Hickling Stannow was acting for her son until of age and includes the names of the owners and occupiers who had been using plots. Some of the names recorded on the deed are worth mentioning. Several are from Coltishall, where they were involved with the Old School House. John Chapman, blacksmith and brewer left all his estates to his nephew Chapman Ives, and £10 per year to educate 10 poor boys in Coltishall church. Those on the list include the Bygraves, a well-known family, the Berneys, whose ancestors include the Pastons, who wrote the famous letters in the 14th century, and the Postles another brewing family in Coltishall. This list of landlords was found in the Tunstead and Happing Licence Register. The Underwood that the Deed of Consent referred to continued to be used for basket making up to the 1950's. There were thousands of round straight sided baskets in use. The fishermen swung their silver darlings, as the herring were known, onto the quaysides in these baskets calling them cran baskets, - so many hundred cran per ship. In the farmyards they were called bushel measures. In the old Covent Garden they were used by porters wearing a thick muffin hat carrying several loaded baskets on top of each other and also competing to see how many empty ones they could carry that way - a dozen or more! So it is likely that one of the reasons for planting the underwood was to provide a living for local people basket making. The willow wands could also be used for hurdles and bundles of them were used for drainage and support under the new roads and railways built by Thomas Telford across the marshes. Even the new road bridge at Potter Heigham was built using them as foundations! The Broads were the source of food, birds, which were shot. In the 1700s and 1800s thousands of them were sent to London by the wagon load drawn by oxen. Marshmen, using the large punt guns (now banned), filled with any old bits of metal or stone, floated gently down in their duck punts towards the decoy funnels and could take hundreds of birds at a time in one shot! The Broads, Hickling included, were a wonderful larder for the Great Metropolis! Those shot included: coot; duck of all sorts, pochard, teal, swan, snipe, plover and so on. With such abuse, and the pollution from farming the newly drained marshes, the birds have gradually disappeared. Within living memory, there were big shoots organised of coot. The most famous of the Pleasure Boat's landlords who will be remembered by those still living was Gwen Amis. She was a toddler at the Pleasure Boat during World War One. Her parents were running the pub and she helped her mother whilst her father was away at the war. At this time she was earning a ha'penny a bundle for stripped willow wands for basket making.The family moved out of the pub in 1924 to a boarding house for visitors who sailed, shot or fished. Gwen married in 1935 and moved back to the pub where no doubt her experience helping at the boarding house came in handy for managing the pub, especially after her husband was called up. She had been in the Women's Institute from the early age of 14 and was into everything that happened in the village of Hickling. This included running the local ambulance service. She was not amused at the waste of time and petrol ration when she was summoned to a supposed bomb scene to be told they "just wanted to see how long it would take her"! She told them what she thought of them! Hardly surprising, given that she had not long had to "clear up" after the unfortunate accidental blowing up of the village hall in Sea Palling, where detonators were being sorted, and after another incident in which two children had come to grief over a land mine on the beach. Gwen is a well remembered, handsome, feisty lady who managed the Pleasure Boat through thick and thin for 37 years until 1971 (Her husband died in 1960). The Pleasure Boat as a Film Set! 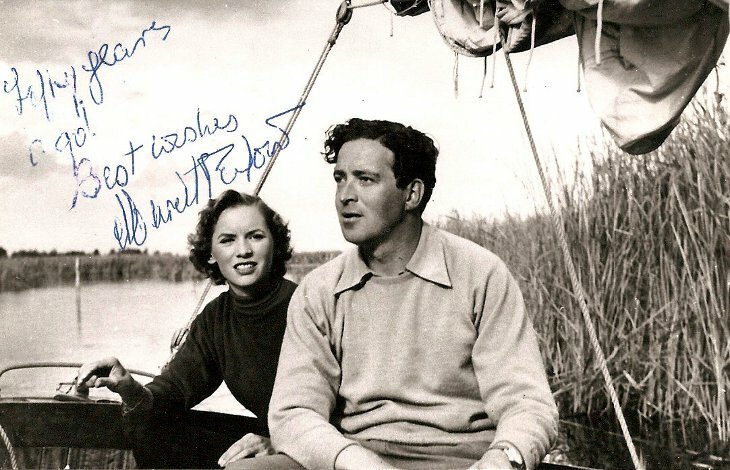 In 1954, the Pleasure Boat Inn was used as a film set for the British film, "Conflict of Wings", starring John Gregson and Muriel Pavlow. In America the same movie was known as "Fuss Over Feathers". It tells the story of rural Norfolk villagers who are spurred to action when it is announced that the nearby RAF station is taking over the Island of Children, a much-loved and untouched bird sanctuary, for air to ground rocket practice. she signed when visiting the pub a few years ago. Much of the film was shot around Hickling, both on the Broad and on dry land, and also at Ludham. Indeed, the star (Gregson) at one point leaves the Pleasure Boat bar and on stepping outside appears, amazingly, in a busy Ludham High Street! Such is the joy of editing. It was in 1959 that Gwen took catering for members of the Royal family quietly in her stride. Prince Phillip, perhaps then better known as the 'Duke of Edinburgh', was a guest of Lord Cadbury at the annual winter 'Coot Shoot'. Their usual accommodation at nearby Whiteslea Lodge was flooded and they were forced to seek accommodation at the Pleasure Boat Inn. The locals carried on as usual throughout their stay. Accompanying the Duke was a young Prince Charles, who was reprimanded by the redoubtable Mrs Amis, for having a pillow fight in his bedroom, the aspect of the stay that made all the newspapers at the time.